In some areas, the partying was raucous and drunken, comparable perhaps to the partying that occurs at Mardi Gras. After the Reformation, some Protestants frowned on the celebrating and urged true believers to spend Christmas at church rather than in the tavern. In the North American colonies, the Puritans refused to celebrate Christmas and at several points attempted to ban the partying, sometimes using the stocks and branding to punish those who could not resist the Christmas cheer. Christmas did not disappear, but it was for a time so inconsequential that Congress did not take the day off for the holiday, deciding to hold its first session on Christmas Day in 1789. Christmas grew in importance in the United States during the nineteenth century. Celebrations did not revolve around a newborn Savior but rather glorified family, community, and assorted “traditions.” Santa Claus (or “Kris Kringle” as he was often dubbed) and the use of Christmas trees became popular in the 1850s, and on June 26, 1870 Congress made Christmas a national holiday. In more recent decades, advanced consumer capitalism has taken a heavy toll, and the slogan “I shop, therefore I am” is never more evident that at Christmas. The marketing of potential Christmas gifts now begins well before Thanksgiving, maybe even before Halloween, and for many the “Christmas season” extends for several months. Indeed, with shoppers lining up outside of Best Buy in the wee hours of Black Friday, it is clear the binge buying of consumer goods has itself become a Christmas ritual. Over time, people have celebrated Christmas for different reasons. Those determined to put Christ back in Christmas should realize we put our values and desires into the holiday as much as the holiday dictates its own meaning. 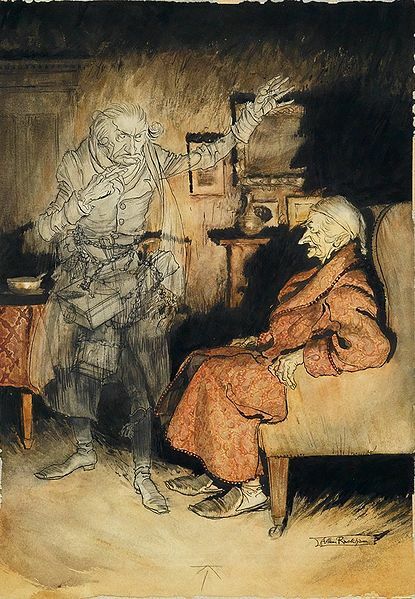 Some even define themselves by rejecting Christmas completely, as did Ebenezer Scrooge in the early chapters of A Christmas Carol by Charles Dickens. I, for one, would like to wish everyone Merry Christmas, Happy Holidays, and the self-fulfillment and well-being that can and should be possible for members of our species. And, out of love and respect for the curmudgeons among us, Bah Humbug as well! Thank you for your post. This link also discusses Dickens’ role in creating renewed enthusiasm for Christmas; the popularity of A Christmas Carol sparked interest in reviving Christmas traditions. It’s interesting to think that “traditions” can change over time and be influenced by a book or other form of popular culture.